Take this convenient one-volume softcover “distillation” any place you need to refer to Folk on the spot. Organized for Quick and Easy Reference! Following the unique and convenient organizational format of the 4-volume set, Folk Fundamentals provides annotated commentary with each section of the statutes. 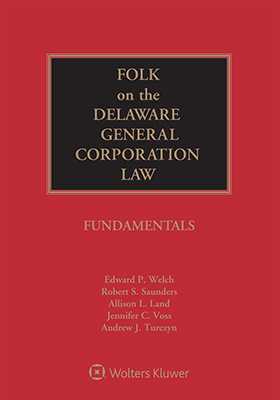 Each section’s commentary incorporates discussion of every significant court decision (including non-Delaware cases) that interprets the language and intent of that section, and adds the incisive analysis of Folk and his successor authors. This expert commentary synthesizes statutes, cases, and analysis into clear, up-to-date guidance that can be put to immediate use in any business activity or situation affected by Delaware Corporation Law or the Delaware Limited Liability Company Act.